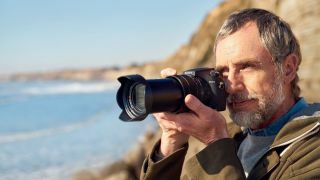 Aimed at high-end amateur photographers, and with an asking price to match, this premium-build bridge camera with pro-like features builds on the legacy of its predecessors. Chief talking points here include a 24-600mm f/2.4-4, 25x optical zoom lens with glass supplied by Zeiss, which makes the camera a great all-in-one option for photographers and videographers. You also get a 20.1MP 1in sensor and BIONZ X processing engine, the latter being a key component in that it handles 4K movie recording with full pixel readout and no pixel binning. Indeed, the video features here punch pro-level territory, and include slow-motion output from 1000fps recordings. Other features include a high-quality electronic viewfinder and a tilting 3in LCD (which isn’t, however, a touch screen), together with Wi-Fi and a very effective image stabilisation system – very useful on an optic of this kind. In terms of handling, the camera feels solid and comfortable in the hand due to a protruding grip and rounded body design. It's a little bulky and weighty, but it's a small price to pay for a camera that can be relied upon to deliver cracking results in a raft of different situations. The camera powers up quickly, with a short delay as the lens extends to its maximum 24mm equivalent wide-angle position. It can autofocus in as little as 0.09 seconds, while sensitivity is expandable from ISO 64 up to ISO 25,600, and you even get a small DSLR-style, top-plate LCD screen which lets you keep an eye on key settings at all times. For added illumination, both a pop-up flash and a vacant hotshoe are provided. Moving to the lens itself, there are two ridged rings, one for zooming and the other for focusing. We love the eye sensor that makes automatically swapping between the LCD and EVF a doddle, while the mode dial and exposure compensation wheel both offer just the right amount of resistance to enable precise adjustment. In summation, the Sony RX10 Mark III may be a fairly niche product – a bridge camera that handles a bit like a DSLR but has the advantage of a huge all-encompassing focal range straight out of the box – but it's nevertheless a camera that’s sufficiently competent for a range of tasks. With a great lens, cracking video and a large sensor that produces excellent images, the RX10 III is a corker.